Adjusting to life in a new country is difficult – there’s a new language, different culture, and finding a job. Road to Livelihood helps make this transition easier for refugees by connecting them to their new home and community in northeastern Wisconsin. We work with other trusted agencies to deliver training programs to help refugees adjust to the United States and learn English, as well as figure out where to buy groceries or get a haircut. We also provide job training and certificates in partnership with area employers that will help you start a career. We’ll work with you and your family to connect you to a community of friends, employers, and support. Contact us for more information about the Road to Livelihood program. When Liban moved to the United States from Somalia, he had to adjust to a new way of life. He joined Road to Livelihood with a goal to make a great life for his family. For work experience, he helped other Somali families fill out forms and practice for interviews. He was so good at this, he joined our team as a full time employee. His work ethic and dedication makes him a real success story. 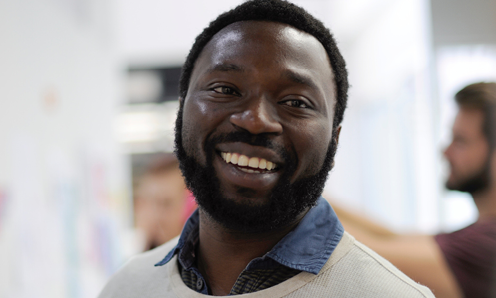 Liban, we’re happy to have you on our team.